Donald Keefe was born in Des Moines, Iowa, and grew up in Southern California. He has lived and worked all over the country, from rural Appalachian Kentucky and West Virginia, to Miami, FL, Los Angeles, and New York city. He currently lives just outside of Chattanooga, TN, where he serves as Assistant Professor of Art at Southern Adventist University. Him and his wife recently had their first child. 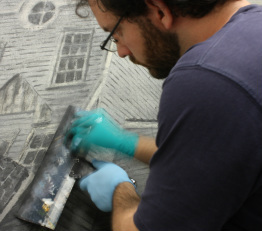 Donald earned an MFA from the University of Florida in 2013 after having received his BFA from the University of Kentucky in 2009. His artwork has been exhibited nationally, won awards, and been published several times. He has also completed private commissions and was the recipient of a federal grant for a public arts project. He feels the greatest thing he has learned from his varied life experiences is to empathize with others and maintain faith and hope through trying situations. From left to Right: Suit & tie; On top of the Schilthorn in Switzerland with my wife; Playing the bass with some friends.